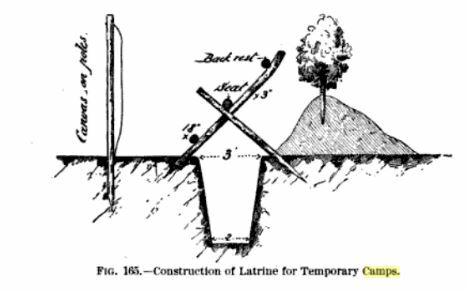 On this page, we add information that we find on Civil War era latrines, called "sinks," at the time. The first series shows examples located behind the Confederate bombproofs in Gracie's Salient. The second series shows an example from near Union Fort Morton. Following that are examples found in later engineering manuals. LC 03624. "Petersburg, Virginia. 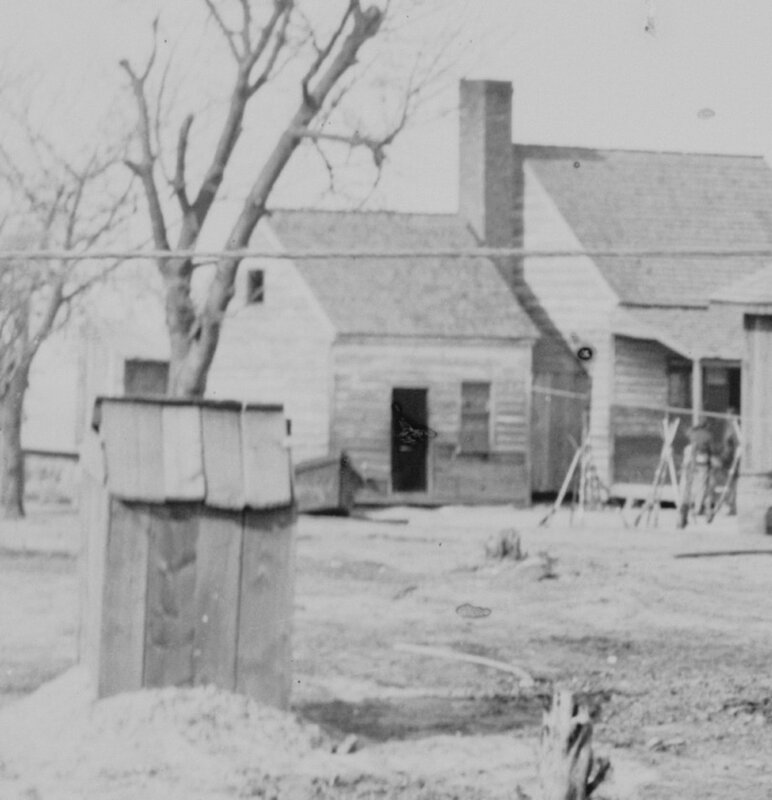 Earthworks in front of Petersburg," stereograph taken of Gracie's Salient by Timothy O'Sullivan. 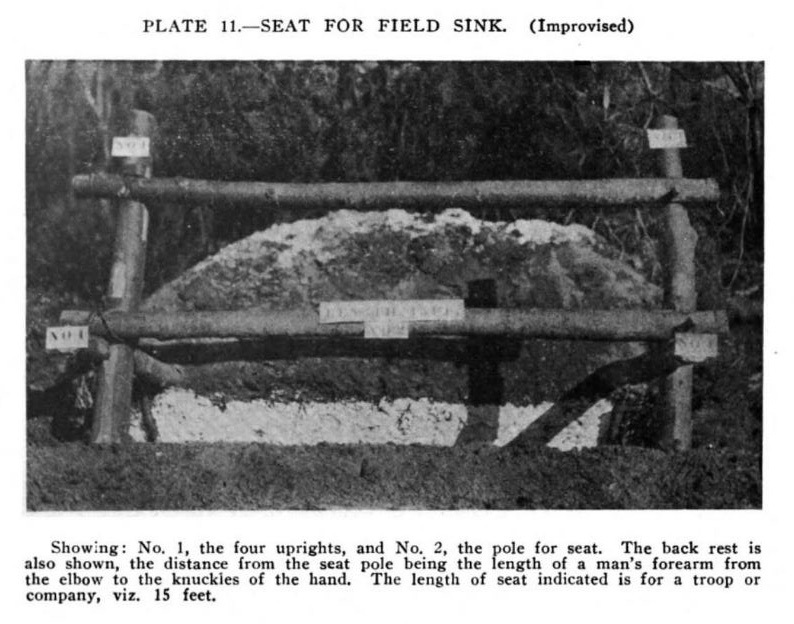 This image shows two types of sinks or field latrines in the foreground. LC 03624 detail. On the right is a classic sit-down latrine -- with a log seat fitted on two notched logs. On the left is a stand-up version or urinal. Note the heavily used trails. LC 03624 detail right. Closer view of the right-hand latrine. When the ditch was full of waste, it was filled in and a new one dug. LC 06324 detail left. A closer view of a stand-up urinal, which appears to have had heavy use. Here is a Union example -- more compact, filled and moved more often. LC 03574. "Petersburg, Virginia. View of Federal line near Fort Morton" In this Federal example, the sinks were placed in front of the main line and behind the fraise. LC 03574 detail. In this Union example, one can see subsequent iterations. The initial sink was directly behind the fraise. When it filled, soldiers dug a new sink closer to camp and threw the dirt forward into the old ditch. This shows a nice view of the log seating arrangement. Sink design changed little over the years. 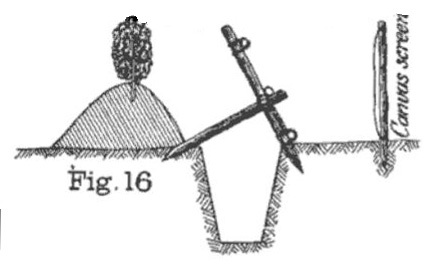 The cross-section shown on the left is from Manual of Military Field Engineering for the Use of Officers and Troops of the Line Prepared at the United States Infantry and Cavalry School by the Engineering Department, London 1897. This manual specifies both latrines and urinals, with urinals placed closest to the camps. A few inches of dirt were to be shoveled over the excreta every day. 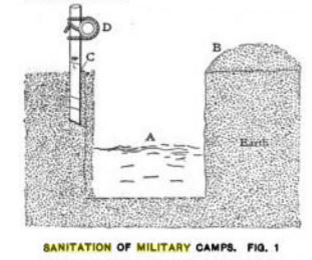 The cross section of a sink on the right is from "Sanitation of Military Camps in Foreign Countries" in Engineering Review, Vol 11, Sept. 1901. This design features the single straddle log without the back rest. 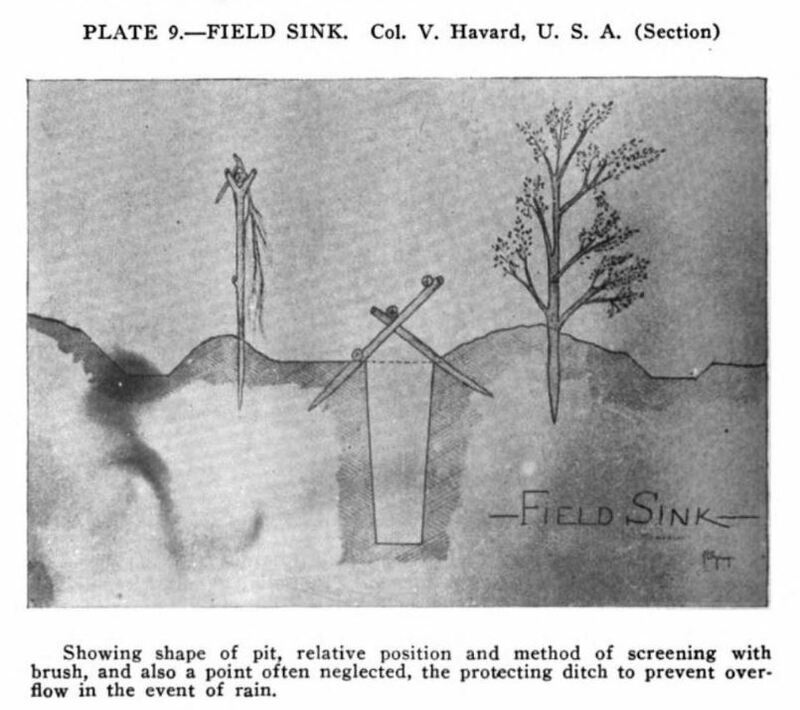 The two illustrations below are from Field Sanitation: A Manual for Non-commissioned Officers by James Sprigg Wilson, Major, Medical Corps, United States Army, 1914. The back rest is an improvement over the single straddle log of the Civil War era. The illustration on right is from The Theory and Practice of Military Hygiene by Edward L. Munson, London, 1902. Sinks were not to be placed near water.